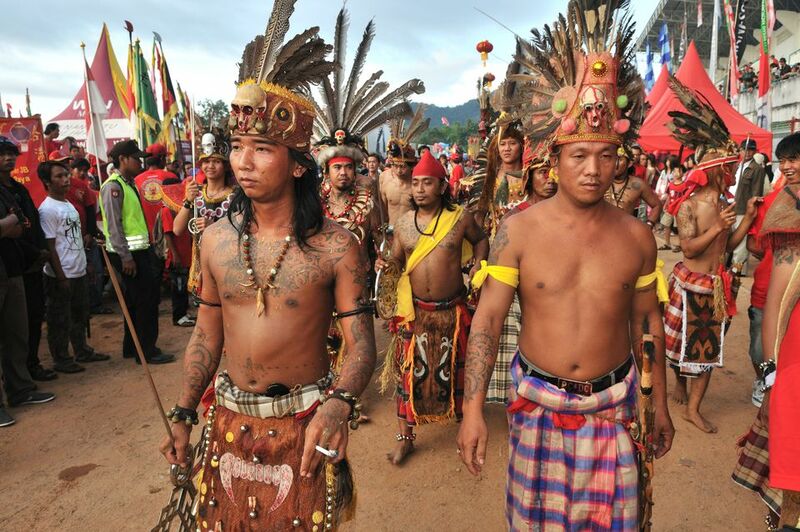 Celebrated with enthusiasm across the island, the Gawai Dayak festival in Borneo is a multi-day harvest festival held on May 31 to honor the island's indigenous people. Gawai Dayak translates to "Dayak Day"; however, celebrations can last for a month! Weddings are deliberately scheduled in June to take advantage of Gawai Dayak. The term Dayak is a grouping of indigenous people including the Iban, Bidayuh, Kayan, Kenyah, Kelabit, Murut and over 200 other tribes which once roamed Borneo, sometimes relieving unsuspecting traders of their heads. Although steeped in headhunting traditions of the past, the only head removed these days during Gawai Dayak belongs to a chicken sacrificed to honor a successful rice harvest. As Christmas is to Westerners and Chinese New Year to people of Chinese ancestry, Gawai Dayak is to Borneo's proud indigenous tribes. More than just a kitschy demonstration of indigenous culture for tourists (although there is some of that), Gawai Dayak is celebrated with genuine joy and enthusiasm — an occasion for weddings and joyous family reunions. In the capital Kuching and around Sarawak — Malaysian Borneo's southernmost state, celebrations begin a week before the official ceremony on the evening of May 31. Kuching holds parades and demonstrations along the waterfront in the week leading up to Gawai Dayak. The official start to festivities takes place at the Sarawak Cultural Village, a popular and convenient place for tourists to learn more about indigenous culture. The Sarawak Cultural Village also serves as the venue for Sarawak's annual Rainforest World Music Festival. On the evening of May 31, Sarawakians kick off Gawai Dayak at the Civic Centre, with festivities including dinner, dancing, and even a beauty pageant. The following day, ngabang begins — the practice of inviting tourists to visit the Iban longhouses all around Sarawak and learn about indigenous culture. Activities differ between longhouses; some allow tourists to shoot traditional blowpipe guns or to watch cockfights. No matter the locale, visitors are always greeted with a shot of tuak, a strong rice wine; drink up or find a place to hide it — refusing is impolite! Iban and Dayak homes are opened during Gawai Dayak, allowing visitors a glimpse of daily life. Tourists are invited to wear colorful traditional costumes for photos, participate in traditional dances, and sample delicious cakes and treats. The families in each longhouse work hard to prepare for Gawai Dayak. Tuak has to be brewed, food secured and preserved, and preparations made for guests. There is a push within the Dayak community to unify the celebration, however, for now, Gawai Dayak remains mostly incongruous with each longhouse holding separate events and itineraries. Do not expect any less from the festival — as many as 30 families can occupy a single longhouse! Across the border, the Dayak of West Kalimantan celebrate the Gawai Dayak festival with as much flair as their brothers in Malaysia. The capital, Pontianak, holds its own Gawai Dayak festival from May 20 to 27 with parades and parties all around the city, and major events centered around an enormous Dayak longhouse replica, Rumah Radakng. The Dayak are an ethnically diverse group, and each tribe across the districts where they hold sway (Bengkayang, Landak, Sanggau, Sintang, and Sekadau) celebrate their post-harvest rituals differently, each honoring Jubata (God) in their own ways. The Rumah Radakng festivities focus on the Gawai Dayak traditions of the Kanayatn (Dayak Kenyan) tribe in particular but offer a tourist-friendly glimpse nonetheless. Festivities include 16 different traditional arts, from oral literature and music to Dayak dances and traditional games. Forget the romanticized stereotypes — not all of Borneo's indigenous people still live in longhouses or choose to don a traditional costume during Gawai Dayak. You'll see far more baseball caps worn on heads than hornbill feathers these days. Many Dayak people have moved from their rural homes into the cities in search of work. Urban Dayak communities may choose to celebrate their holiday simply by taking time off work — a rare occasion — to visit family outside of the city. Christian Dayaks often attend mass at a church and then celebrate with dinner at a restaurant when observing Gawai Dayak in Borneo.